The age of the vines here varies from 25 to 90 years old, sourced from plots in Le Chaillot, Les Mezards and les Reynards. A near opaque colour with an iridescent sheen cedes to a fantastic bejewelled palate, which seems to be both modern and traditional at the same time, such is its creamy richness and its fine savoury finish. 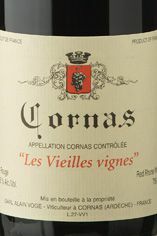 The Wine Advocate - The 2010 Cornas Vieilles Vignes is jaw-dropping stuff. Inky colored and incredibly concentrated, with sensational notes of bouquet garni, iron (blind I might have guess 2010 Clape), violets, crushed rock and decent black and blue fruits all soaring from the glass. Full-bodied, layered and pure, with awesome freshness despite it massive size and concentration, it's a profound Cornas that needs another 3-4 years of bottle age yet will have three decades of overall longevity. Parker - The black/purple-colored 2010 Cornas Vieilles Vignes reveals an amazing nose of blackberry jam, cassis, spring flowers, camphor and graphite as well as a touch of smoky meat. Full-bodied, with good acidity and loads of tannin, it needs to be forgotten for 5-7 years and drunk over the following 20-25 years. Domaine Alain Voge is an excellent domaine based in the Northern Rhone wine appellation of St Peray and has been no stranger to Berrys over the years. 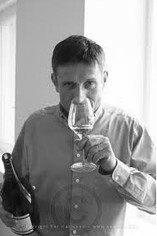 From the more traditional end of the spectrum, which in terms of Cornas means wines of incalculable gravitas, the Voge wines are now vinified by Chapoutier alumnus, Albert Mazoyers, and have never been better. The domaine's philosophy is to practice biodynamic viticulture on the slopes of the Rhône right bank, dedicated to Syrah and Marsanne.